I got the privilege to sport a handlebar moustache for the past week. Now, I have been growing my moustache since early december and still didn’t get the length I was looking for. I think I have convinced my wife that I will need even more growing time next year. The handlebar did definitely get the most praise of all my different styles. It is not one you see enough these days and brings fond memories to many. I got a lot of “monopoly mans” and Rollie Fingers and even Mr. Peanut, who didn’t have a ‘stache but who knows. 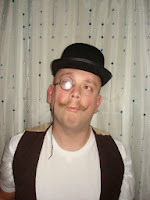 I do think it was an apt way to bring some enthusiasm towards the end of another wonderful Moustache March!